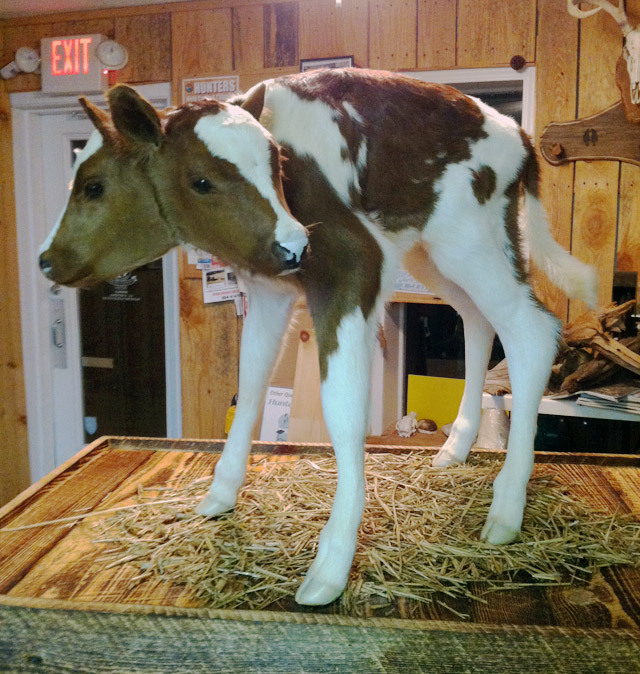 A two-headed calf was born on a farm in South Carolina in 2012. It died shortly after birth, as is often the case. 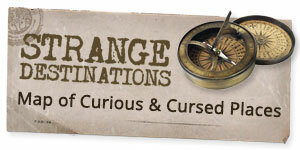 Once the initial shock wore off, farmer James Anderson decided to preserve the rare oddity. He sent it off to Grover Bearden of Southland Taxidermy Studio in Easley, South Carolina. Bearden, a skilled taxidermist who also serves as vice president for the South Carolina Association of Taxidermy, took on the unique challenge. 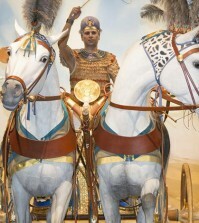 The life-like mount was unveiled last week, garnering much media attention. Bearden was kind enough to take some time to chat with me about his work and the opportunity to breathe life back into such an unusual specimen. 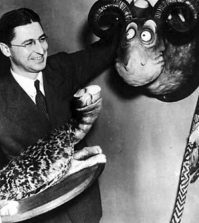 Cult of Weird: How long have you been a professional taxidermist? 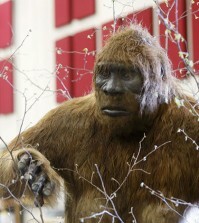 Grover Bearden: I have been involved in the art of taxidermy for 16yrs with 4 of those years being my full time career. I am also a member of the National Taxidermy Association and a National Certified Taxidermist. Have you mounted anything unusual before? Bearden: The weirdest thing I had mounted before was snakes and a Spanish goat. I am always being asked what’s the weirdest thing I’ve done but didn’t really have much to say in reply. 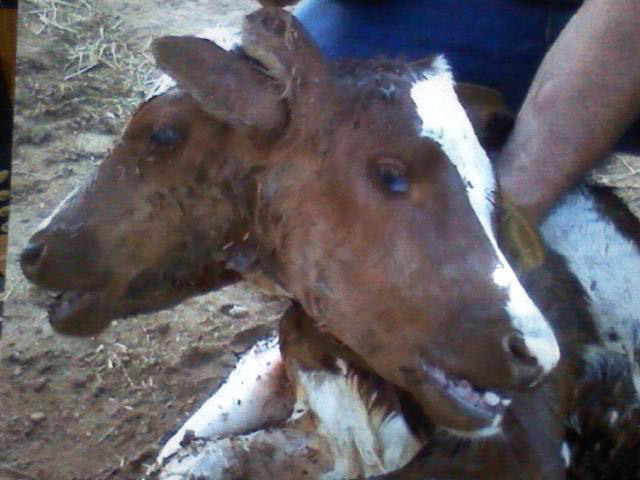 What were your first thoughts when you saw the carcass of the two-headed calf? Bearden: When I first saw the 2-headed calf it was a little bit shocking but in reality it was cool. It was Mother Nature at her worst or best, who knows what to call it? Either way I knew I had a challenge in front of me. How long did it take to complete? Bearden: I never ran a clock on my time but if I had to guess my total time I would have around 80hrs in this piece. What were the the unique challenges involved? Bearden: The challenges with this piece was it had two heads and other physical abnormalities and I had to make the mannikin to where the skin would fit it perfectly. 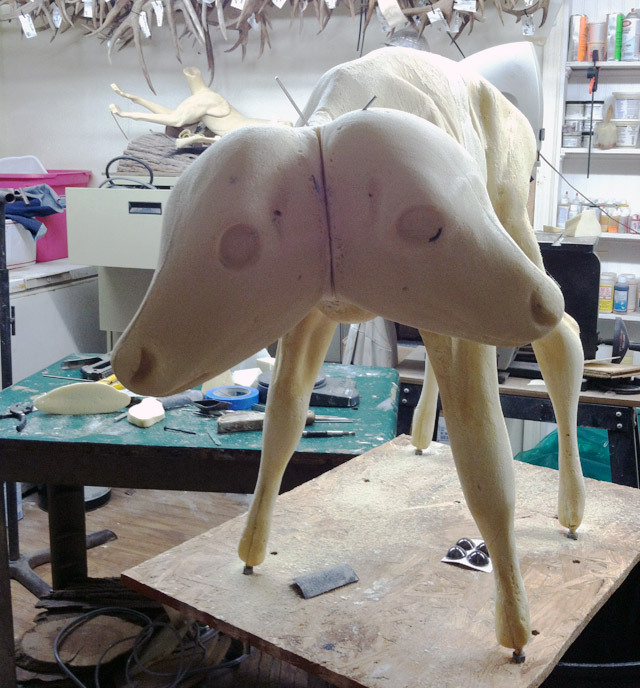 I saved the carcass so that I could have it as a template to alter the mannikin to the same shape and size. What is the general reaction people have when they see the calf for the first time? Bearden: When some folks see it I think they don’t believe it’s real. I’ve been asked if they was birth mates. I just laughed and said yes but they only had one body. Others are simply amazed at what is before their eyes. Are there any plans to articulate the skeleton or display the skull? Bearden: I still have the carcass and am planning to articulate the skeleton. The calf had 2 separate skulls. It would’ve been cool if they was connected, but at the end of the neck was 2 atlas. 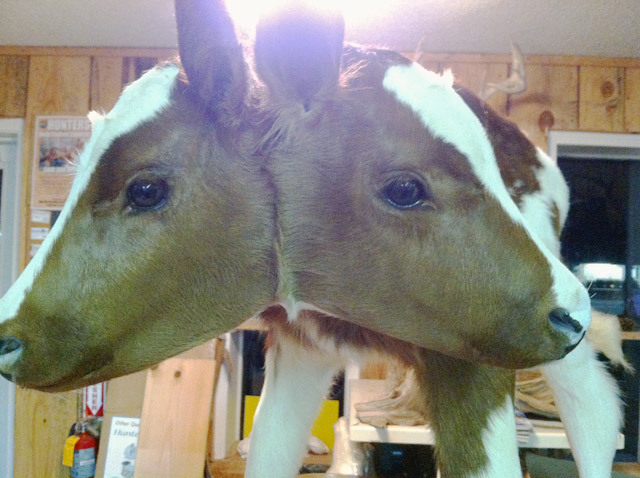 A reference photo shows the two-headed calf shortly after birth. 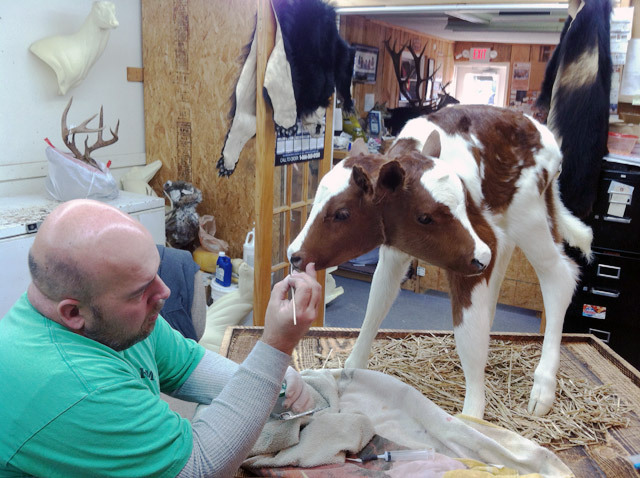 Bearden altered a standard calf mannikin to accommodate the second head. Bearden putting some finishing touches on the calf. If you are interested in seeing the calf in person, Anderson plans to display it in his strawberry shop…if his wife will let him.